Rickettsia species belonging to the spotted fever group (SFG) cause infections in humans, domestic animals and wildlife. At least ten SFG Rickettsia species are known to occur in China. However, the distribution of rickettsiae in ticks and fleas in the border region of northwestern China have not been systematically studied to date. A total of 982 ticks (Rhipicephalus turanicus, Dermacentor marginatus, D. nuttalli and Haemaphysalis punctata) and 5052 fleas (18 flea species from 14 species of wild mammals) were collected in ten and five counties, respectively, of Xinjiang Uygur Autonomous Region (northwestern China). Tick and flea species were identified according to morphological and molecular characteristics. Seven sets of primers for amplifying the 17-kDa antigen gene (17-kDa), citrate synthase gene (gltA), 16S rRNA gene (rrs), outer membrane protein A and B genes (ompA, ompB), surface cell antigen 1 gene (sca1) and PS120-protein encoding gene (gene D) were used to identify the species of rickettsiae. Nine Rickettsia species have been detected, seven of them in ticks: R. aeschlimannii, R. conorii, R. raoultii, Rickettsia sibirica, R. slovaca, R. massiliae and “Candidatus R. barbariae”. In addition, R. bellii and two genotypes of a rickettsia endosymbiont (phylogenetically in an ancestral position to R. bellii) have been detected from flea pools. This study provides molecular evidence for the occurrence of several SFG rickettsiae in Rhipicephalus turanicus, Dermacentor nuttalli and D. marginatus. 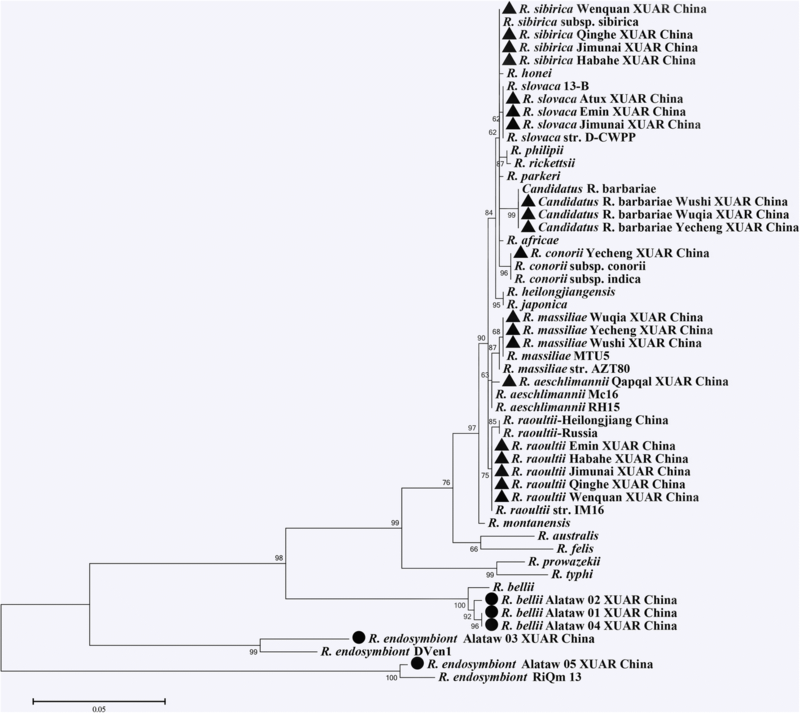 Furthermore, R. bellii and two ancestral rickettsia endosymbionts are present in fleas infesting wild rodents in the border regions of northwestern China. These data extend our knowledge on the diversity of rickettsiae in Central Asia. Rickettsiae are obligate intracellular Gram-negative bacteria causing infection in humans, domestic animals and wildlife [1, 2]. Their vectors are typically ticks, fleas or mites, but rickettsiae were also shown to be present in several other arthropod groups [3, 4]. There is a great variety of clinical presentations of rickettsioses, and some pathogenic species, which cause debilitating diseases, are listed as bioterrorism agents . Members of the genus Rickettsia are divided into four clades: spotted fever group (SFG); typhus group (TG); ancestral group (AG); and transitional group (TRG) . To date, ten valid Rickettsia species have been detected in China [7–10]. In previous studies, seven species of rickettsiae (including R. aeschlimannii, R. conorii, R. raoultii, Rickettsia sibirica, R. slovaca, R. massiliae and “Candidatus R. barbariae”) were shown to be present in ticks or fleas in Xinjiang Uygur Autonomous Region (XUAR) [7, 8]. There is a great diversity of tick and flea species in XUAR, owing to the variability of geographical landscape and the availability of multiple vertebrate host species for these parasites [11, 12]. Therefore, the aim of this study was to systematically analyze the occurrence of Rickettsia species in ticks and fleas in the border region of XUAR. XUAR, located in northwestern China, covers 1.66 million square kilometers, and is bordered by eight countries (in the northeast Mongolia, northward the Russian Federation, in the northwest and west Kazakhstan, Kyrgyzstan, Tajikistan, and in the southwest Afghanistan, Pakistan and India) . During the period between 2014 and 2016, late April to mid-May (coinciding with the peak activities of adult ticks), 982 adult ticks (675 males and 307 females) were collected from ten counties including Jimunai, Emin, Wenquan, Qapqal, Qinghe, Habahe, Wushi, Artux, Wuqia and Yecheng, while 5052 fleas were collected from Alataw, Burqin, Huocheng, Wenquan and Qapqal counties in the border area of XUAR (Fig. 1). The first six counties of tick sampling and the first three counties of flea sampling are located in the northern region, whereas the remaining counties are located in the southern part of XUAR. Jimunai, Emin, Wenquan, Qapqal, Artux and Huocheng counties are adjacent to Kazakhstan. Artux, Wushi and Wuqia counties are adjacent to Kyrgyzstan, Qinghe and Yecheng counties are neighboring on Mongolia and Pakistan, respectively, and Habahe county shares a border with Russia and Kazakhstan. Ticks were collected from cattle and sheep after examining the entire body of each animal (including predilection sites such as ears, neck, armpits, thorax, abdomen, femurs, perianal region, etc.) [11, 14]. For flea sampling rodents were captured with Sherman traps (H.B. Sherman Traps, Tallahassee, Florida, USA), which were placed at the entrances of occupied burrows . Each survey site included 150 traps that were checked twice a day. Each trap was removed before nightfall and replaced on the survey site the following day. The abundance and species of fleas were determined in each captured rodent. The animal fur was combed thoroughly until no additional fleas were recovered. After this, each rodent was released . All ticks were identified morphologically according to previous reports [17, 18]. To confirm tick species, 80 specimens (5–10 for each tick species representing every sampling county), were used for molecular taxonomic analysis. The genomic DNA was extracted from each tick individually, using the TIANamp Genomic DNA Kit (TIANGEN, Beijing, China). All 80 tick DNA extracts analyzed based on partial mitochondrial [12S rRNA, 16S rRNA and cytochrome c oxidase subunit 1 (cox1)] gene sequences [19, 20]. Fleas were identified morphologically using a compound microscope and observing key structures [21, 22]. Depending on the flea species, host and sampling site, every 1–15 fleas were pooled together for DNA extraction by using Isolate II Genomic DNA Kit (BioLine, Sydney, Australia) as previously described . The DNA extracts of 70 flea pools were included in multi-locus sequence analysis using four genes, i.e. the 18S ribosomal DNA (18S rDNA), 28S ribosomal DNA (28S rDNA), cox2 and elongation 1-alpha (EF-1a) as described previously . Seven sets of primers for amplifying the 17-kDa antigen gene (17-kDa), citrate synthase gene (gltA), 16S rRNA gene (rrs), outer membrane protein A and B genes (ompA, ompB), surface cell antigen 1 gene (sca1) and PS120-protein encoding gene (gene D) were used to identify the species of rickettsia [25–27]. An additional genetic marker 17-kDa2 was used to confirm the presence of the rickettsiae in fleas . Sequence-confirmed rickettsia DNA amplified in our laboratory and double distilled water (Dongsheng, Guangzhou, China) were used as positive and negative controls, respectively. PCR products were purified using the TIANgel Midi Purification Kit (TIANGEN, Beijing, China) and cloned into the pGEM-T Easy vector and subjected to sequencing. A phylogenetic tree was constructed using the maximum-likelihood (ML) method with MEGA 6 software . All sequences obtained in this study were compared with GenBank data using the nucleotide BLAST program (http://www.ncbi.nlm.nih.gov/BLAST/). Representative sequences including 22 from ticks, 78 from fleas, 84 from rickettsiae in ticks and 12 from rickettsiae in fleas have been deposited in the GenBank database (accession numbers shown in Additional file 1: Table S1, sections A, B, C, D, respectively). A total of 982 ticks, belonging to three genera and four species (401 Rhipicephalus turanicus, 180 Dermacentor marginatus, 319 D. nuttalli and 82 Haemaphysalis punctata) were collected from ten counties of XUAR. Rhipicephalus turanicus (40.84%) was the most frequently collected species, followed by D. nuttalli (32.48%), D. marginatus (18.33%) and H. punctata (8.35%). Seven Rickettsia species including R. aeschlimannii, R. conorii, R. raoultii, Rickettsia sibirica, R. slovaca, R. massiliae and “Candidatus R. barbariae” were detected (Table 1, Fig. 2) in the ticks from cattle or sheep. “Candidatus R. barbariae” was mainly detected in the southern region, whereas R. raoultii was a dominant rickettsial agent in the northern region of XUAR. In addition, a total of 5052 fleas, belonging to 6 families, 15 genera and 18 species were collected from 14 mammalian species, including Rhombomys opimus, Meriones meridianus, Meriones libycus, Meriones tamariscinus, Marmota baibacina, Vormela peregusna, etc. (Table 2). Among them, Xenopsylla gerbilli minax (52.40%) was the dominant species, followed by Paradoxopsyllus repandus (9.70%), Citellophilus tesquorum dzetysuensis (8.31%), Oropsylla silantiewi (7.52%) and Nosopsyllus laeviceps laeviceps (6.00%). Rickettsia bellii and two genotypes of a rickettsia endosymbiont (phylogenetically in an ancestral position to R. bellii) were molecularly detected in five flea species (Echidnophaga oschanin, Nosopsyllus laeviceps laeviceps, Paradoxopsyllus repandus, Rhadinopsylla cedestis and Xenopsylla gerbilli minax) of Alataw county. The BLAST analysis of rickettsial agents are shown in Additional file 2: Table S2. In this study, nine Rickettsia species have been molecularly detected in 982 ticks and 5052 fleas collected in 13 border counties of XUAR, neighboring Kyrgyzstan, Mongolia, Pakistan, Russia and Kazakhstan. Considering ticks, R. massiliae, R. aeschlimannii and “Candidatus R. barbariae” have been detected in Rh. turanicus, while R. raoultii, R. slovaca and R. sibirica were found in D. marginatus and D. nuttalli. Based on these findings, several SFG Rickettsia species occur in highly abundant tick species in the border regions of XUAR. In particular, Rh. turanicus, D. marginatus and D. nuttalli might play key roles in the propagation of rickettsiae across country borders in the region. In addition, the present data revealed significant differences in the spectrum and prevalence of rickettsiae between the north and south XUAR, most likely as a consequence of variations in the abundance of corresponding vectors and reservoirs. Rickettsia bellii was previously detected in members of the genera Dermacentor and Amblyomma, in which it also undergoes transovarial transmission . This Rickettsia species can be cultured in mammalian cells and may cause disease in mammals . Here, R. bellii is reported for the first time in China. Detections of R. bellii in Xenopsylla gerbilli minax, Echidnophaga oschanin and Paradoxopsyllus repandus fleas are also novel findings. More interestingly, two genotypes of a rickettsia endosymbiont (ancestral to R. bellii) have been identified for the first time in Rhadinopsylla cedestis and Nosopsyllus laeviceps laeviceps fleas. These results indicate that some flea species infesting wild rodents in the border regions might carry different, probably ancient Rickettsia species or genotypes. Therefore, these data extend our knowledge on the geographical distribution and reservoir spectrum of AG rickettsiae. XUAR has a great variety of landscape and habitats, maintaining a broad range of mammalian and avian species, which could serve as hosts of diverse tick and flea species. In this study, seven SFG and two AG Rickettsia species have been detected in border regions of northwest China. Surveillances of rickettsial agents in border regions of Central Asia are particularly useful and informative, because data from such monitoring studies are relevant to several countries, which are involved in international trade of livestock and livestock products, but may also be affected (in the context of rickettsioses) by movements of wildlife and migratory birds [11, 31]. In this study, nine Rickettsia species were molecularly detected in 982 ticks and 5052 fleas in the border regions of XUAR, northwestern China. The data indicate the occurrence of several SFG rickettsiae in Rh. turanicus, D. nuttalli and D. marginatus collected from ruminants, as well as of AG rickettsiae in fleas infesting wild rodents. These data extend our knowledge on the diversity of and potential vector/reservoir range of rickettsiae in central Asia. Shengnan Song, Chuangfu Chen and Meihua Yang contributed equally to this work. The authors thank the contributions by the staff at the School of Medicine and School of Animal Science and Technology, Shihezi University. This research was supported in part by the National Key Research & Development Programme of China (2018ZX10101002-002-007, 2017YFD0500304 and 2017ZX10304402-002-005) and National Natural Science Foundation of China (81560338). The sequences obtained and analyzed during the present study are deposited in the GenBank database under the accession numbers KT878385-KT878387, KU364354-KU364359, KU364361-KU364367, KU364369-KU364371, KU364375, KU601752, KU757301-KU757306, KX254161, KX254163-KX254164, KX457946-KX457954, KX668365-KX668384, KX822749-KX822752, KX822754-KX822757, KX999715-KX999719, KY593298, KY593300-KY593301, KY593303, KY593306-KY593309, KY593311-KY593312, KY593314, KY593316-KY593317, KY593319, KY610534-KY610535, KY610537, KY610542-KY610545, MF000668, MF000670-MF000671, MF000678-MF000681, MF002497-MF002508, MF002515-MF002516, MF002518-MF002558, MF002560-MF002565, MF002567-MF002568, MF002570-MF002576, MF002578, MF002580-MF002583, MF002585-MF002591, MF045759-MF045765, MF045767, MF136071-MF136074. All other relevant data are included in the article and its additional files. SS, CC, MY and YW conceived and designed the study, and critically revised the manuscript. SZ, BW, BM and KR performed the experiments, analyzed the data. SS and SH contributed to writing the manuscript. All authors read and approved the final manuscript. This study was approved by the Animal Ethics Committee of Shihezi University (Approval No. AECSU2014-03). Song R, Wang Q, Guo F, Liu X, Song S, Chen C, et al. Detection of Babesia spp., Theileria spp. and Anaplasma ovis in border regions, northwestern China. Transbound Emerg Dis. 2018. https://doi.org/10.1111/tbed.12894.